Straight cut. 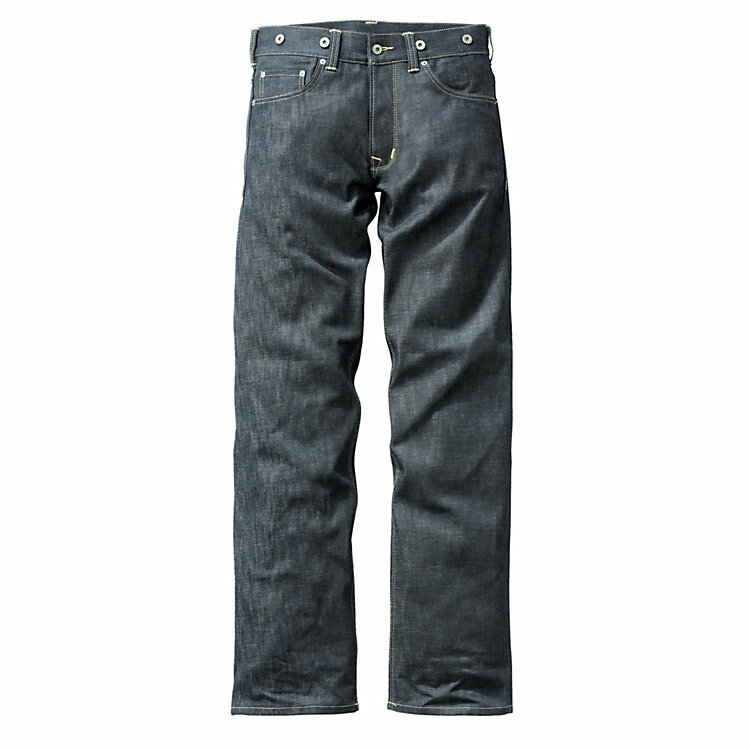 Raw denim 100% cotton (11 oz) not pre-washed. Metal rivets and buttons. Garment manufactured in Turkey. Hem width approx. 47 cm. We have preserved all the original details: the belt loops, the rivets for the suspenders, the “cinch back”, the adjustable straps at the back to regulate the fit, so you can simply “tighten your belt”. Similarly for the length, if they are too long, just turn them up! Other characteristics are the straight leg, the high waist and rivets to reinforce the stress areas. These jeans are true in material and design to the original American jeans designed in the early 1930s. The rugged roughness of the fabric is proof of the raw denim (11 oz) used to manufacture them, and they do need some time to be, literally, “worn in”. The cloth is woven in Turkey and the traditional selvedges are proof of their authenticity. Recommendations on how to wear your jeans. The jeans require some time to be worn in. The manufacturer suggests that you do not wash the jeans for a few months. To maintain the dark rich color and to prevent shrinking, the jeans should, if at all, only be machine washed in cold water, otherwise the jeans will shrink in length by at least one size. Do not tumble dry. Detailed washing instructions are provided with your garment.